The images are licensed and not included in the package. I used images from shutterstock and you can get them here. The images that are used are from shutterstock and you can get them here. Download and unzip the ‘Bright_Child_Theme_UNPACKME.zip’ file to your computer. Locate the bright_div_child_theme.zip file in the Bright_Child_Theme_UNPACKME folder on your computer and then click Install Now. When the install is complete click on ‘Activate’, you will then see the Bright Child Theme as the active theme in your theme panel. Click on Import and upload Bright Theme Options.json. Click on Import and upload Bright Customizer Settings.json. Click on Import and upload Bright Builder Layouts.json. Here you will find all the pages from the demo. Load the Home page Bright and publish it. The row of the grid has a background image with a blue gradient. You can change this image and gradient by opening the row and go to background. Upload 6 images in your media library that you want to use as a backgound when you hover over a column. Upload images that have atleast a size of 1240x630px. I do recommend to make the mb size of the images as low as possible. 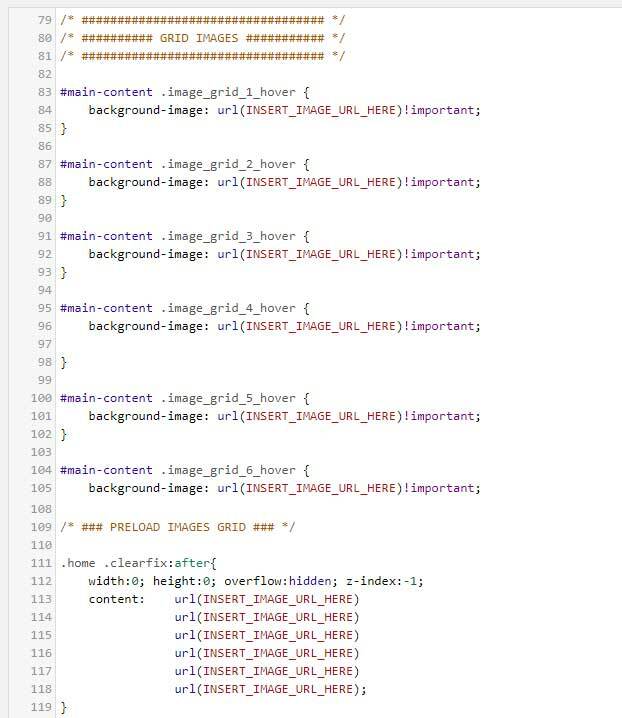 At line 84, 88, 92, 96, 101 and 105 you can replace INSERT_IMAGE_URL_HERE with the images you just uploaded in step 1. image_grid_1_hover is for column 1 etc. To get the image link go to your media library and click on the image you want to use as a background. When you did the steps above your image grid will work. However the images will start loading until you hover over a column this will cause a small delay. To avoid this we need to preload the images. At line 113 to 118 you can insert the same URL’s that you did previous. 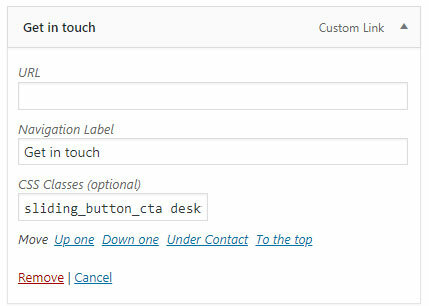 We have to create two CTA buttons, one for the desktop and one for mobile devices. Go to Appearance > Menus and add a custom link. The URL field needs to be empty, you might need to insert something otherwise you can’t add it but afterwards you can remove the URL field. Add the CSS classes sliding_button_cta desktop_cta to this menu item. Add another custom link. This URL field need be linked to your contact page. The slide-in doesn’t work from the dropdown menu so we need to link it to your contact page. Add the CSS classes sliding_button_cta mobile_cta to this menu item. To make edits in the silde-in go to Divi > Divi Library and open Sliding CTA Bright. You can add any module in the slide-in. The bottom section is the Tab label which you see on the left on the front end. You can activate the slide-in with any button or link. For example you want to add a button module somewere on your page and when you click on it the slide-in needs to appear. The link needs to be #slideopen. You can replace slideopen with something else if you like but it need to have the # symbol before. Go to Load From Library > Add From Library and choose Single post Bright.